Thursday marks four years since the deadly Asiana Airlines crash at San Francisco International Airport, and a newly released video of the crash holds some important teaching moments, experts say. 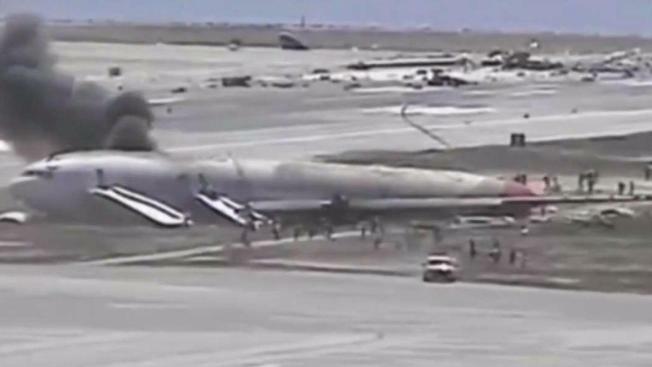 The video from an airport tower, according to one aviation expert, shows one major mistake and several heroic moments after the crash of Flight 214 that killed three people on July 6, 2013. The video shared by the aviation blog flight.org shows the airplane slamming into the ground, the plane on fire and then the evacuation slides inflate, allowing passengers to escape the burning the aircraft. Aviation analyst Mike McCarron said he believes the evacuation was about 30 seconds too late, and he blames the pilots for the poor decision. "As soon as the plane came to a stop, those doors should have been popping open," McCarron said. "People should have been getting out of the aircraft. That is unacceptable." McCarron credits the flight attendants for initiating the evacuation and applauds the crew for a quick evacuation once the slides were opened. The video also shows moments when it appears emergency personnel are running up the slide into the burning plane to rescue injured passengers. McCarron said because airplane accidents are so uncommon, the video should be used as a powerful learning tool to teach pilots, emergency personnel and flight crews how to handle an emergency situation. "The passengers got out safely because the way the aircraft was designed," he said. That’s the good part. The bad thing is all the procedures have to be followed such as evacuation immediately." SFO officials confirmed the video is authentic but declined to comment further.